Wednesday, March 30, 10-12 a.m. "PROPULSION & FUELS I"
Dr. M.K. Eberle, Sulzer Broth- ers, Winterthur, Switzerland. Quincy Shipbuilding, Div. Gen- eral Dynamics. Peter Luciano, Executive Di- rector, Transportation Institu- tion. Robert Lowen, President, Mas- ters, Mates and Pilots. Wednesday, March 30, 2-4 p.m. "PROPULSION & FUELS II"
David Royle, Det norske Veri- tas. Thomas N. Pratt, Engine De- sign Sect., Electro-Motive Divi- sion, General Motors Corp.
Donald J. Andrews, Vice Pres- ident, Shipping Dept., First Bos- ton Corp.
President, Shipping Dept., Mor- gan Guaranty Trust Company. Finance Manager, Armco Indus- trial Credit Corp. Manager Specialist, Sun Trans- port Inc.
Timothy Berkell, Vice Presi- dent, Fleet Manager, Stolt-Niel- sen, Inc.
Materials Division, Office of Mer- chant Marine Safety. National Cargo Bureau (speak- er to be announced). Max Carpenter, Special Proj- ects Director, MITAGS. Chief, Office of Navigation, U.S.
Find out how economical our new QES system is. Contact us for a demonstration at your location or for literature about the QES system. With more than 30 direct company Branches, there's a Patent team of proven products and experienced people near your site. Call our near- est Branch or contact our headquarters at (800)526-0441; TWX: 710 991 9589. In New Jersey, (201)461-8700. No welds stressed. No critical castings. 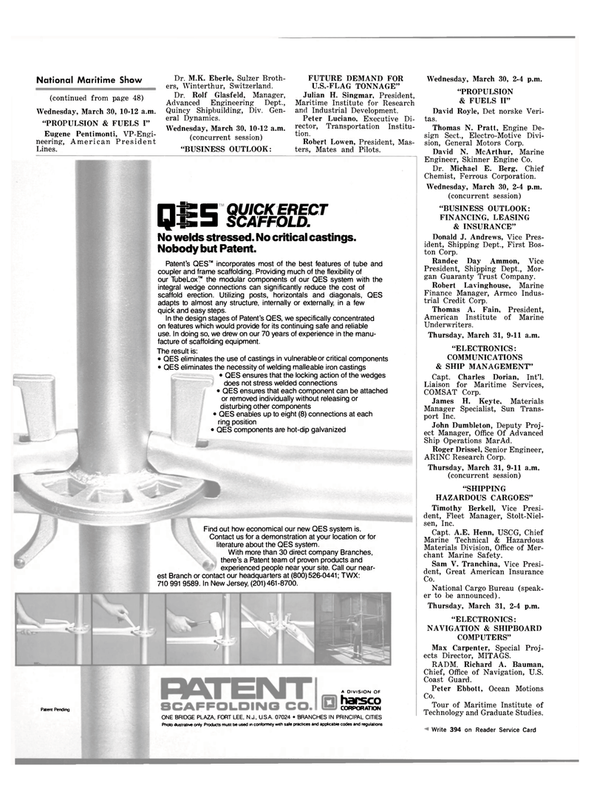 Patent's QES™ incorporates most of the best features of tube and coupler and frame scaffolding. Providing much of the flexibility of our TubeLox"" the modular components of our QES system with the integral wedge connections can significantly reduce the cost of scaffold erection. Utilizing posts, horizontals and diagonals, QES adapts to almost any structure, internally or externally, in a few quick and easy steps. In the design stages of Patent's QES, we specifically concentrated on features which would provide for its continuing safe and reliable use. In doing so, we drew on our 70 years of experience in the manu- facture of scaffolding equipment.